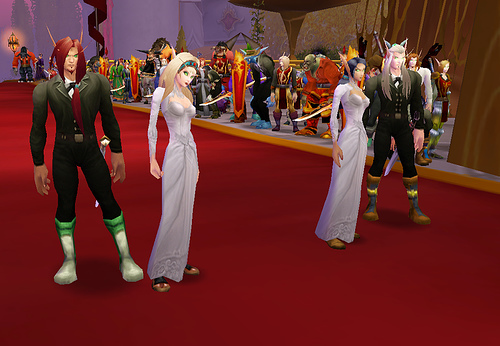 Are Games Like World of Warcraft the Future of Online Dating? | It's not your tech, it's how you use it. Honestly, the piece is anything but – and it’s actually a pretty great story about how MMOs and other online games where an avatar represents you in a virtual world can actually be a great way for people to get to know each other in a non-threatening way without forcing them to meet up in a crowded bar or put either of them in an awkward situation. Sure, sure, there’s the inevitable “you don’t look like the photo you emailed me” moment that’ll come later if someone chooses to be dishonest, but hey – there are benefits too, you know? With a little help from our friends at Jezebel and their post World Of Warcraft Is The Future Of Online Dating, let’s take a look at how you can be a classy geek and still get your flirt on, even in Azeroth. First and foremost, I would say that it’s important to use the blanket of anonymity and distance to your benefit, as opposed to your detriment. What does that mean exactly? It’s simple: Be Honest. Seriously – so many people assume that in a virtual world of environment that everyone will lie and make themselves out to be more than Moncler outlet they really are that most people I’ve encountered find it a breath of fresh air that I’m actually very much who I am in analog when they meet me digitally, you dig? The piece looks over some people who met through the game and wound up falling in love – from a New York Times piece called Love at First Kill, which followed some couples that have or do play the game together. I’ve been down that road before – it’s a double-edged sword, but it’s a good one to have. It can be a great way to meet good friends and spend time with someone you like (especially if you both like the game and have similar interests in that regard) but it can also expose issues in your relationship if you decide to play different ways and it causes friction. Other gamers have echoed that sentiment, saying that typing their feelings or flirtations is less awkward than saying them aloud. That can lead to more-honest conversations, and fewer misunderstandings. It’s why many players believe that they come to know each other faster and better than, say, people who meet over a few dates. Personal experience: I’ve found this is very true, not just romantically. It’s very much easier to be open and honest with someone virtually when you know that you’re interacting behind a screen, but it’s not that it dulls the feeling at all, it just gives you a sense that you have more of an escape route. It’s almost like you’re having an Moncler outlet incredibly lucid and emotional dream, but in the back of your mind you know you can always wake yourself up, so it feels a little less threatening. Following me? Now if you’re a gamer – especially a social gamer and you’ve played MMOs with people and been involved in drama and whatnot with multiplayer games – then you already know what I’m talking about, and you’ve probably already been down this road before. Like I said before – the important thing is to be honest. And by be honest, I mean be honest to yourself and to the other person, the way I described in Debunking the Myth of the “Nice Guy”. The more honest you are, the more success you’ll have. If you try to conceal something about yourself, or puff yourself up, trust me, you’ll get found out eventually and it’ll be a bigger issue later than it would be earlier on. “There’s something magical about falling in love with someone just through writing and then waiting for a reply,” said Ms. Langman, for whom Mr. Bentley once stormed a castle. Emphasis mine. Situations of peril can be romantic, even when simulated, and it’s no surprise that some people fall in love after performing acts of derring-do for one another in Warcraft. Compared with your typical dinner date, storming a castle is pretty impressive. Yeah seriously – he stormed a castle for her? You go, son! That’s how you impress a lady – storm the castle, cut down the trash, and clear a path for her to get out. And you didn’t even have to use a battle rez. Ahem. Anyway: I think that’s an important point too – sure games turn us into impossible beings that do impossible things, but they also give us something to bond with each other over instantly. Something we can have deep conversations about, conversations which to outsiders may seem shallow, but to insiders have infinite ways they can branch off into real personal discussions of personal beliefs, histories, dreams, and passions. All it takes is a question like “Why do you play a Paladin, anyway?” to set an RP fan off discussing their character and how they relate – which can open the doors to an element of their personality you would never see on someone’s Match.com profile. See geeks? There’s hope for you yet, and it’s right under your nose. Just use it wisely, and oh – when you do decide to meet for the first time? Let me help you pick something to wear. 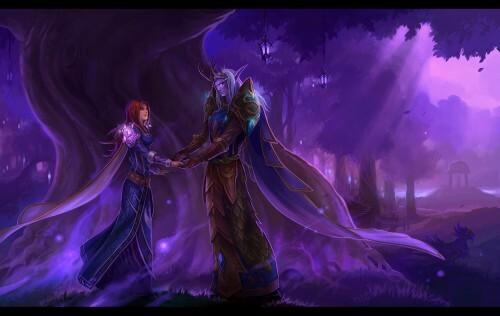 the gorgeous image used as the header in this post and the first one below the jump is called “Lovers in Darnassus” and was done by Sandara, of DeviantArt. Go see her work, seriously. So true. My husband and I met in World of Warcraft during his first deployment, and got to meet face to face during his 2 weeks of leave. I was worried it would be a bit weird meeting 'IRL' because I am usually very shy. But since we had already spent so much time getting to know each other in an environment where I didn't have to be shy it was more like meeting up with a good friend than a first meeting. This year will be our fourth anniversary now, and things are great.